April 1, 2009, 9:06 PM · The genre of theme park movies pretty much begins and ends with "National Lampoon's Vacation." Friday, Greg Mottola's "Adventureland" hits screens in the United States. Mottola most recently directed the comedy "Superbad," and earlier worked with Judd Apatow on the TV show "Undeclared." But before any of that, Mottola was... an amusement park employee. The now-44-year-old worked in the 1980s at a Long Island amusement park called Adventureland, and has written and filmed a movie loosely based on that experience. 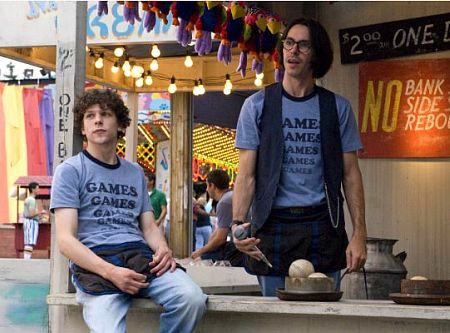 Jesse Eisenberg, Martin Starr star. Photo courtesy Miramax. They've kept the name, but shot the movie at Pittsburgh's Kennywood, which filmmakers grunged up to look like a more decrepit '80s suburban carnival park. In Mottola's film, working in a park isn't a glamor job: The movie's website tag line? "Long hours. Low pay. High times." Yeah, expect a lot of stoner jokes in the flick, which, like Superbad, revolved around a smart, earnest young geek trying to make it with any one of a number of elusive girls. In the end, though, the main character tones down the nerd act, gains some cool and gets some of what he's, um, been looking for. But working in a park affected me deeply, too. Mottola made a movie. I built a website. Okay, I worked at a better park than Mottola did, but he'll make far, far, far more cash off his project than I'll ever see off mine. Still, I thank him for inspiring me to spend several hours on the Magic Kingdom West Attractions Alumni Facebook page, clicking through hundreds of old pictures, remembering faces and incidents I'd since forgotten, but swiftly remembered. I've spent almost two decades working in journalism, traveling the country and meeting people from disabled farm workers to U.S. Senators. But working in a theme park remains, by far, the most social job I've every held. Every month I worked at the Magic Kingdom was crammed with rich moments that could fill several movies. I was invited to an advance screening of the movie, but could not attend. But I'm looking forward to hearing what Theme Park Insider readers have to say after the movie opens on Friday. April 1, 2009 at 9:54 PM · I'm all about seeing this one. I like most of Judd Apatow's stuff (he at least produces a lot of them) anyway, although I wasn't that into Superbad. I'll watch even the worst movie if it contains some amusement/theme park scenes. I have an ever growing collection of movies, TV shows, and footage from the past. April 2, 2009 at 1:11 AM · Well, it's better exposure than Final Destination 3. The next comment I post might be my last on TPI! TMI? April 2, 2009 at 6:06 AM · I'm telling you Robert -- as someone who also worked in the Magic Kingdom -- someone could right a decent theme park novel about working at WDW in the 1980s and 1990s. April 2, 2009 at 7:20 AM · Always nice to see some kind of amusement/theme park in a movie. I may not rush out to see this one in the theater, but the dollar DVD rental looks good. My favorite movie which is solely about amusement/theme parks is called "Rollercoaster". The movie came out in 1977 and offered "Sensurround" in the theaters. This meant that large PA speakers were set-up in the theater and the sound was much more intense. This aided in a more realistic sensation to the rides shown. This was also before the newer Dolby Digital sound formats. The movie had quite a few named stars. George Segal, Richard Widmark, Timothy Bottoms, Henry Ford, and Helen Hunt to name a few. The plot is about a terrorist who is able to blackmail a series of amusement companies by placing home-made radio controlled bombs in amusement parks, and on roller coasters. For those who haven't seen this movie, I think it's worth checking out. Keep in mind it is based in the 70's, but does have footage of Kings Dominion, and Six Flags Magic Mountain to name a few parks. I'm not sure if you can rent it on DVD, but I'm sure a VHS may be available. There is always some scene's on youtube also if anyone is interested. April 2, 2009 at 7:51 AM · I saw the trailers for this a while back and definately want to see it. Fingers crossed for this weekend, work permitting! April 2, 2009 at 10:17 AM · I can't wait to see this movie. I grew up on Long Island and went to Adverntureland all the time in the 60's,70's and 80's. It's still there and very popular. The rides are geared toward the younger kids and has a carnival atmosphere but it's still a lot of fun. I usually came home with a goldfish. April 2, 2009 at 2:21 PM · Rollercoaster is available on DVD. I owned it. Past tense. I remember loving it when it came out. Didn't hold up very well for me so it didn't stay in my collection. But I'd say it is worth a one-time rental. Add it to your Netflix queues. April 2, 2009 at 8:39 PM · I have Rollercoaster. I also own an episode of The Brady Bunch titled "Cincinnati Kids". It heavily features a newly opened Kings Island. It's pretty cool to see the park then as compared to now. April 3, 2009 at 8:18 AM · I viewed this movie last night at an advance screening. First, I want you to know that if you liked Twilight, you'll like this. But, don't expect Kristen Stewart to be as innocent as she was in Twilight. The film focuses on a college student who is ready to pursue grad school at Columbia when his parents give him the bad news. That his father has been demoted and received a pay cut. Therefore, they can't afford to pay for him to attend school in NYC. So, reluctantly he gets a job at a local amusement park working in the games department. It is there were he learns that he really isn't much different than many of the others who work there. Amid the cheesy music and whacked out employees, James (Jesse Eisenberg) meets and falls in love with Em (Kristen Stewart). This really is a romantic comedy for the Theme park nut, more so the nuts who work in the parks themselves. As many of the inside jokes are laughed at by mostly park employees. I give this movie a 4.5 out of 5 stars. If you haven't seen a movie in a long time. Than this is definitely a good one to go see. My daughter has the entire 'Brady Bunch' series on DVD, and is more excited to go to Kings Island this summer than any other amusement park we will visit. It's amazing how long movie and TV references like that can have promotional power. April 3, 2009 at 8:54 AM · I caught this at a preview screening on Tuesday, and thought it was an average movie. The performance of Kristen Stewart was very weak and convoluted, and tarnished and reduced the quality of the supporting performances. I really wanted more Bill Hader and Kristen Wiig, but their characters took a back seat to the primary love story. The promotion for this movie is advertising this as "from the director of Superbad," and in that respect, many people may walk out of the movie disappointed. There are part of the film that are pretty funny, but a majority that revolves around the central love story I would describe as "artsy." Where this film succeeds is with its portrayal of Kennywood. The film is set in 1987, and aside from a few shots of Phantom's Revenge in the background, all of the on location shots are very believable and authentic. There are lots of shots of The Racer, Thunderbolt, and Jack Rabbit. One of the running gags revolves around the park's Musik Express flat ride. In general, I was surprised with the amount of location shooting that made the final print, including a scene that was set in a backstage maintenance area. Theme park fans, especially those who have been to Kennywood, will enjoy this movie, but as a whole, this film just missed the mark for me as a comedy. April 3, 2009 at 10:26 AM · Just because this movie has the back drop of kennywood park does not mean it is a "must see" of amusement park affectionados. I wish the amusement park fans would not show up to see this junk, and force Hollywood to make good films with a Kennywood or amusement park background. This won't happen however. This is what bad film making, bathroom, fart humor, female degredation, gay bashing is all about. Save your $10.00 and save it for the parks this summer. They are going to need our help and support for a potentailly down summer. Skip the traash movie, support the parks. April 3, 2009 at 12:37 PM · Thanks for the updated comments to Robert's initial post. Like I said....I'll just wait til the dollar dvd rental to check this one out. I also wanted to thank those who also posted comments, etc...about the "rollercoaster" movie I spoke about. The updates, etc... were informitive! I only wish to add this thought.....???????????? Imagine......While riding your favorite coaster that you could actually end up dead or truely injured???? Not only does the ride experience thrill you, but add this into the mix and then you truely have a ride to appreciate don't you??? Just a thought, but all riders beware....???? I only wish to add my scare scense into the equation to see if ANY other might get the same charge out of it??? April 4, 2009 at 1:56 PM · It's NOT an amusement park movie and if you all expect that, go rent Rollercoaster. It was a very predictable "coming of age" style movie that showed Kennywoods Phantoms Revenge, Thunderbolt and Jack Rabbit in glimpses. It was about family issues, drinking and sexual encounters of an adolescent 21 year old crowd that haven't been to college and all live with their parents. If you are all into that, by all means spend the $11.00 on a ticket. The best part of this movie was my date. April 4, 2009 at 8:56 PM · I just got back from seeing it and both my date and I enjoyed it. I wouldn't consider it that much of a "theme park movie" - however, some of the gags around the Musik Express and the Horse race game (and the mannequins with hats game - never seen that one) were hilarious. Bill Hader and Kristin Wiig should have gotten more screen time. The part that made me laugh the loudest is when they were running low on googly eyes for the stuffed bananas. It's a very "real" movie - somewhat depressing. Don't expect bright lights and happy kids. It's more about true post-colleage angst and living in an economically depressed area. All the conversations seemed very real and not Dawson's Creek/Gossip Girl amped up. It is a good movie worth seeing if you go in with the right expectations.